Lots of garlic, parsley, oregano, and olive oil give this recipe plenty of flavor, and make the perfect balance with sweet, plump mussels. You can make these Steamed Mussels in White Wine Sauce for a first course. However, we love this dish so much that a first courses portion never seems like enough, so we usually serve it as a main course. Be sure to check out our serving suggestions after the recipe. Serves 4 as main course. To serve as a first course, just halve the recipe. Put the olive oil, shallots, garlic, wine, and oregano in a large, wide-bottomed soup pot and bring to a boil over medium heat. If you want a bit of extra zing, add the red pepper flakes. Add the mussels, cover, and cook for 3 minutes, shaking the pot periodically so that they cook evenly. Divide the mussels among 4 bowls. Taste the sauce, and if you want, add salt. 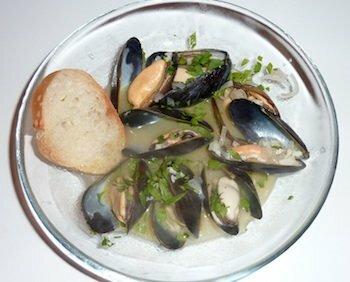 Ladle the hot broth over the mussels and garnish with the chopped parsley. On hot summer nights, we serve this as a main course out on the deck under the stars. Be sure to have plenty of crusty French or Italian bread on hand for dipping into the sauce. Serve with slices of cold melon, and perhaps sorbet and biscotti for dessert. On cold winter evenings, we also like to serve these mussels with white wine sauce and bread for dipping as a first course, followed by salmon, rice, a spinach salad with orange slices, and a slice of chocolate tart for dessert.